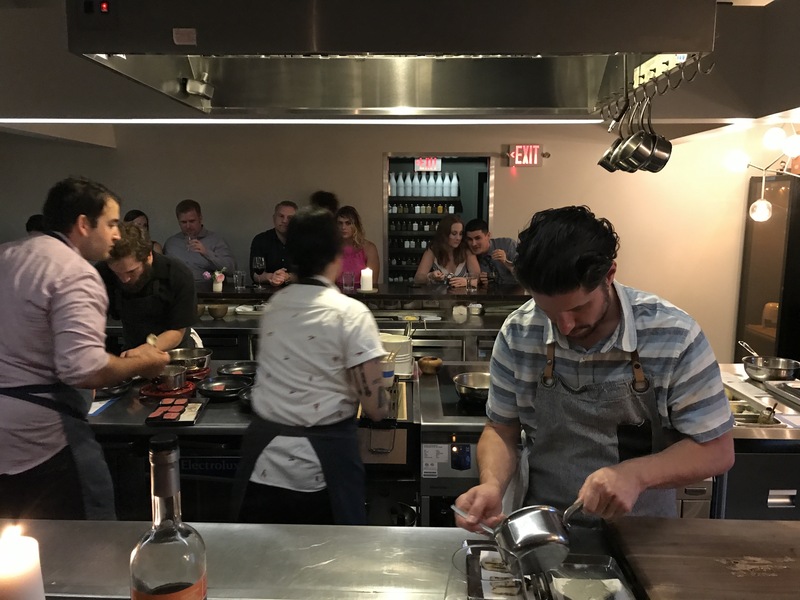 May 12, 2017, it was a fully stocked 24 patron night at the U-shaped counter that serves as one continuous communal dinner table outlining the kitchen of Catbird Seat. The two of us sat off to one side in our own little world admiring the hum of the kitchen and observing other guests as if they were the missing paintings on the barren walls. Typically at a Tasting, one or two dishes really stand out and we round out the evening discussing our favorites and what makes them so. We liken a tasting menu to a music album in that successful bands write mostly good songs. If they’re talented, they have a few chart-toppers, but even then, the album is often riddled with mediocre tracks sandwiched around a few songs that you skip right past. As with anything in the world of art, there’s a clear good, better, best and often it’s just a matter of personal preference. 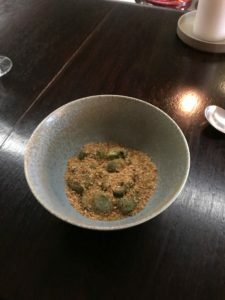 For the first time in a long time, the “favorites” conversation got tough at the end of our meal at Catbird Seat. 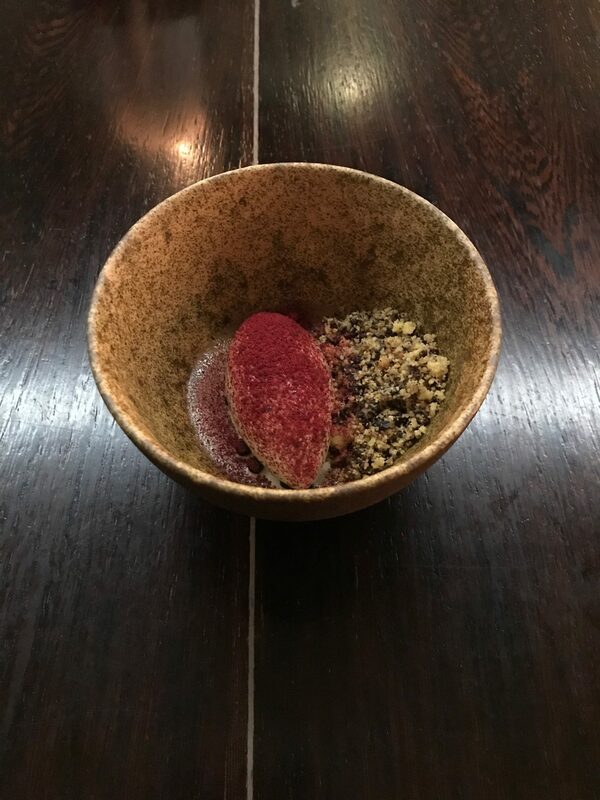 Chef doesn’t sandwich a few amazing dishes around a handful of “meh” courses and he’s not just a few-hit-wonder either. In the world of music, we’d liken our experience to “Pet Sounds” by the Beach Boys. On that album, every song is a work of brilliance and at Catbird Seat each dish rivals the preceding – you don’t want to skip to the next course and not one dish is short of exceptional. Front to back, Poli just nails the experience in its entirety. Given the mastery of his craft, neither Brandon nor I had our stock answer of the clear winners and runner up dishes. 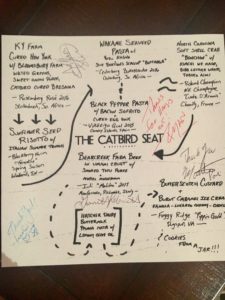 Without using an exorbitant amount of words or descriptors to ruin the magic for you, here’s 4 reasons why Catbird Seat rivals NYC, Chicago and Europe receiving international press by the Diners Club Discovery, World’ 50 Best Restaurants. (1) Typically we pass up the pairing only because we don’t find that wine enhances our overall experience that much and we really hate getting buzzed and then forgetting what the food tasted like. 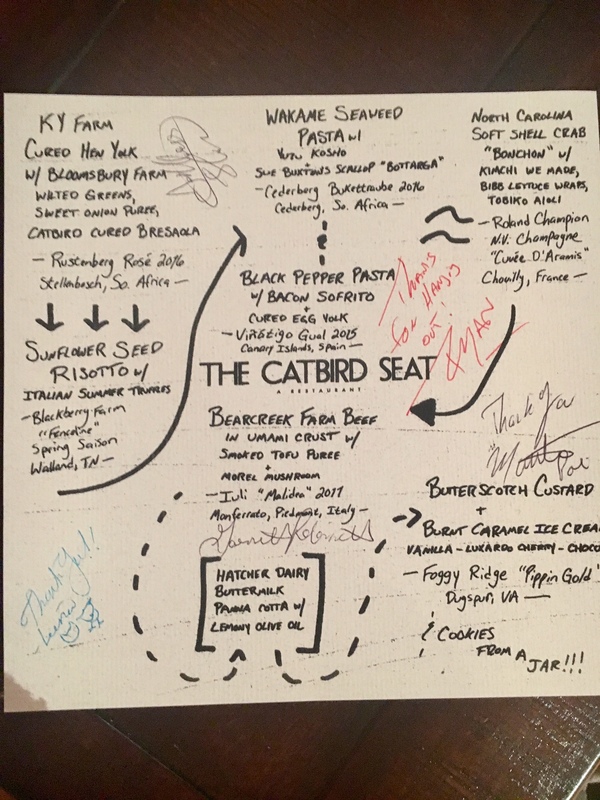 At Catbird Seat, however, things went down a bit differently. 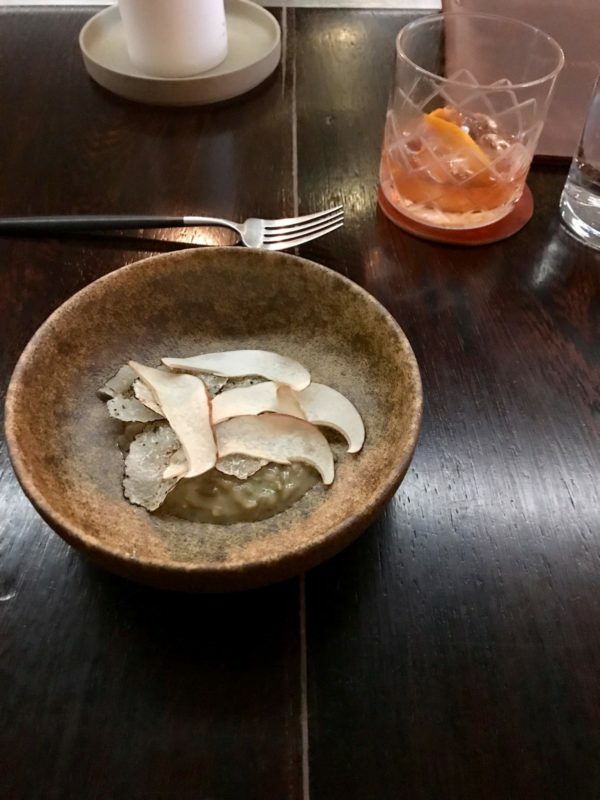 Thanks to Matt Poli – “Resident Ice Slayer” and Beverage Director, the pairing added a great deal of complexity to the already amazing flavors of each dish and the pours were well thought out from a bite-to-sip ratio. We encourage getting the pairing and we will continue to do so upon future visits. (2) The ambience is simple. No nonsense. 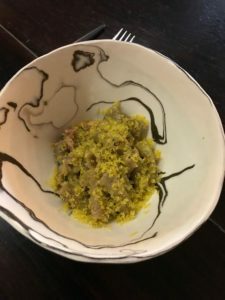 Chef Poli and his staff know their stuff, take pride in their craft, give world-class care to their guests, but don’t take themselves too seriously which is perfect because we gravitate toward light-hearted and fun approaches to cuisine. 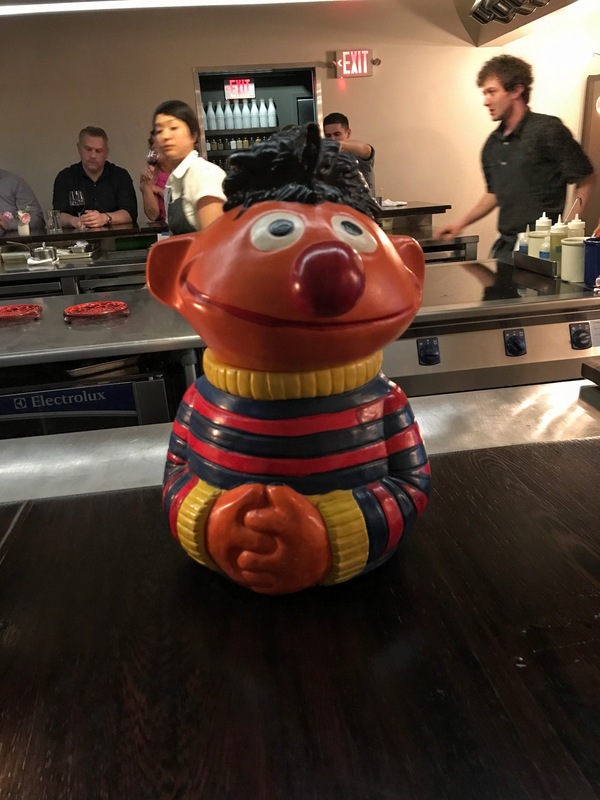 Other guests and the kitchen are the only artwork you will see. Take your seat and the main attraction begins. (3) Every dish made us utter to ourselves, “OMG, this is good.” The expression of the night ended up being, “I could eat three more of these…” As with anything, overindulgence can kill the magic, so five to six bites of each plating was just satisfying enough to satiate our appetites but leave us wanting just one more bite. (4) Pacing. We sat down to 9 different courses that translated to 6 memorable dishes (not differentiating the palate cleanser, interchangeable pasta in course 3 and conclusion). All were spaced out perfectly across 2 hours and 15 minutes. Now for the food described in our own words from memory. Dish 1: Hen yolk soaked in fish sauce and greens wilted in sherry vinegar with a pour of Rosé from South Africa. Dish 2: Fresh truffles over sunflower seed risotto with a glass of Blackberry Farm Saison beer. We added on a side-car Manhattan in hopes of experiencing some of the speciality ice that the Resident Ice Slayer chisels on the roof deck. Dish 3: Shaved scallop pasta with seaweed paired with Cederberg wine from South Africa & bacon pepper egg yolk pasta paired with white wine from the Canary Islands for sharing bites back and forth. Dish 4: Soft shell crab tacos prepared Korean style as lettuce wraps – most surprising dish of the night – the fried crab paired nicely with bubbly! Roland Champagne from France. 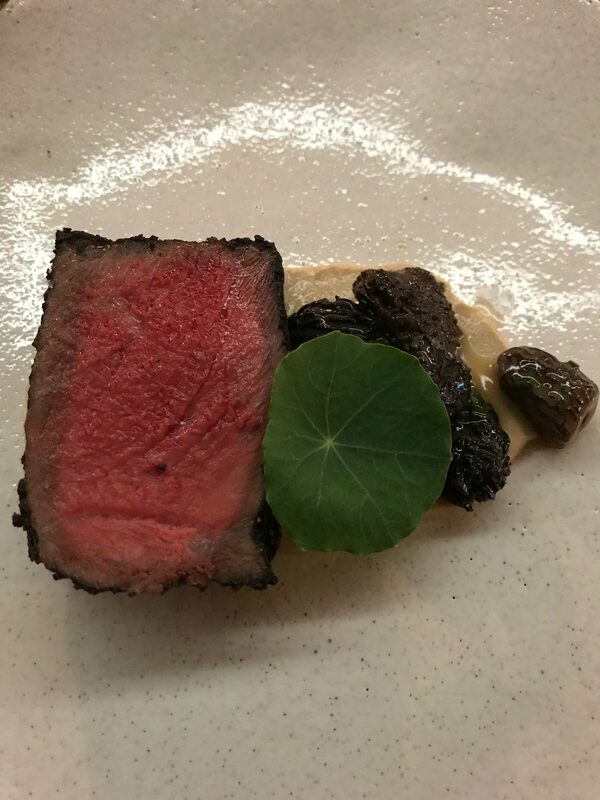 Dish 5: Seventeen (17) Seasonings crusted Bearcreek beef with tofu paste and mushrooms paired with Malidea wine from Italy – direct name translation ‘bad idea.’ We loved it! Palate Cleanser: Panna Cotta with lemon olive oil and we asked the Somm to surprise us with a spirit because he had nailed it up to that point. 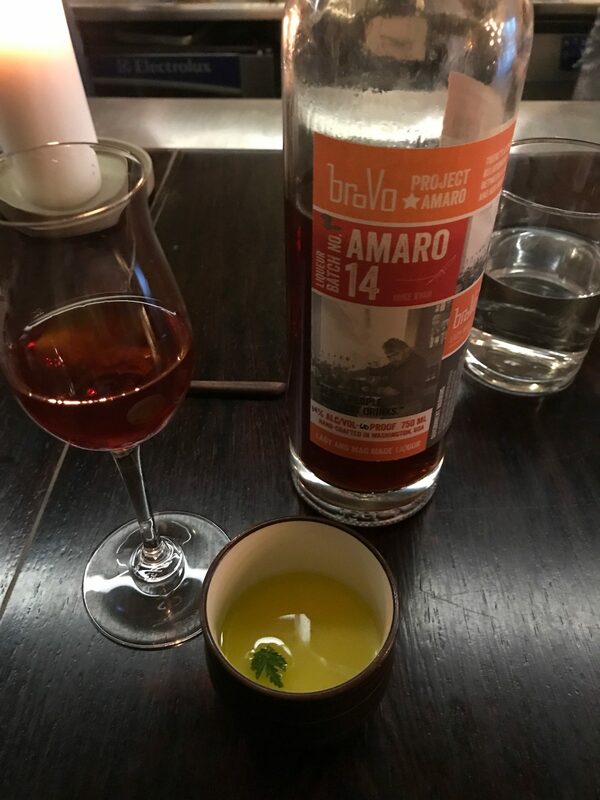 The selection was entirely up to him and he came back with Brovo Amaro 14. Dish 6: Butterscotch custard & burnt caramel ice cream, Luxardo cherries with a final pairing of apple cider port from Virginia. In summary, Chef Ryan Poli is a charming, funny and innovative guy incorporating his worldly travels into his recipes. 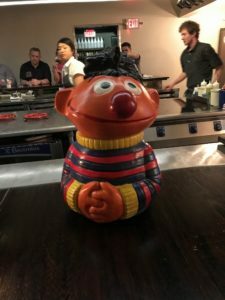 He delivers an eloquent Japanese-American-Italian flare overhauling stereotypical southern cuisine. The entire staff is pleasant and accommodating. The meal is well-paced and the food is the main attraction. The menu changes monthly. We had fun. 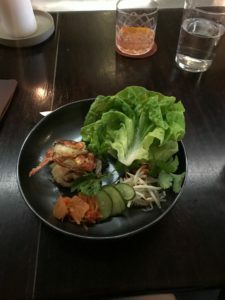 Not only was the food delicious, but the ambience was refreshing and we’d take this Nashville experience right along side New York City or Chicago cuisine any day of the week. Nashville is high on our food radar and The Catbird Seat is the future of fine dining. Below is the May 12, 2017 menu, so you can check my work since I wrote this entire review from memory. The meal was that damn memorable!!!! Thanks for reading! Going now to listen to Pet Sounds on vinyl while working on a reservation at The Catbird Seat again for 25 days from now. Chef Poli is to fine dining what Brian Wilson is to music. For Pet Sounds, Wilson’s goal was to create “the greatest rock album ever made” — a personalized work with no filler tracks. 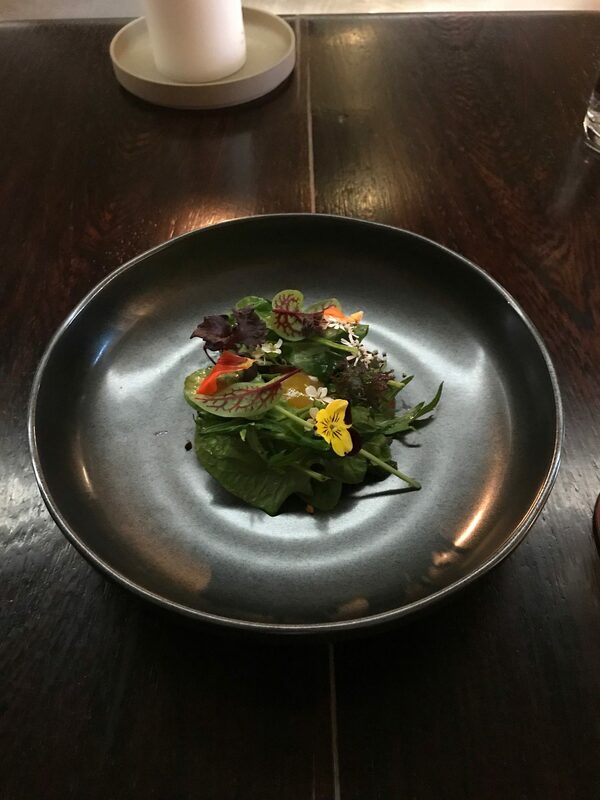 Ryan Poli’s menu goals are already there. Nashville doesn’t host James Beard or Michelin Starred restaurants, but I bet it will be just a matter of time before there is a shift and/or lesser known establishments in the USA begin to be ranked by either the aforementioned agencies or perhaps a new system for determining excellence emerges. I located your site from Google and it was a fantastic find.